THAMES VALLEY CLEANING SERVICES LTD. Your requirements for your office cleaning will be undertaken by an experienced, professional company, and you can rest assured that all your office cleaning needs will be taken care of. 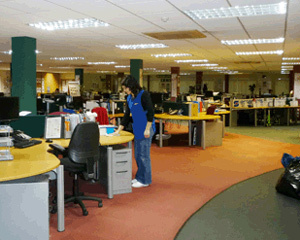 A clean working environment is essential in modern day business. With a clean office your staff will feel the benefit both physically and mentally, fewer bacteria to spread germs around the office, and less clutter and mess to distract your staff. Your customers and visitors will notice if your premises are dirty and untidy straight away, so to give a good first impression let us take care of your cleaning and you will never worry about your visitors arriving. We have a varied customer base which includes large and small office blocks, HQ's, factories, warehouses, showrooms, laboratories, local authority communal areas, health centres, schools, museums & leisure centres. Rest assured we have the experience to provide the professional cleaning services your company needs.